For most people Christmas time is associated with presents and festive dishes. But this great holiday has also some other crucial idea. That is to teach our children essential values. I will give you some tips on how to give a good lesson to your kids while celebrating Christmas. No doubt children all over the world adore this fantastic holiday. Winter holidays enable all people, kids and adults, to feel the majestic festive atmosphere and experience positive emotions. Christmas season is like a fairy-tale and we certainly have a desire that it never finishes. Nowadays we begin to forget about the real values of Christmas. Some material things like presents come to the first place. I’m convinced that children usually look forward to the holiday only because of gifts, delicious food and bright decorations. Surely that is very nice. But to enjoy the material things is not the complete meaning of Christmas. There is something more important. We should try to send the main idea of this season to our kids’ minds and hearts. 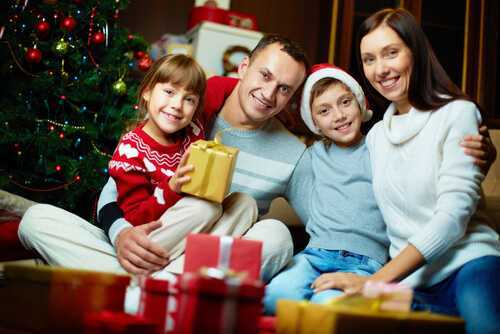 It’s the task of all parents to reveal the essence of Christmas to their children. So it’s necessary to remember the basic values which are to be taught to your children. When some time passes they will definitely appreciate your lessons. This wonderful holiday is a nice opportunity to show your love to others. And don’t forget to tell about that to your kids. Teach them to be kind, tolerant and loving with their family and friends. For example you can make it a tradition to write Christmas cards for each other. There you will express your great love to your children and how much you appreciate them. They should do the same. Certainly love doesn’t mean only good and pleasant words, your actions can speak about your feelings more than anything else. That’s why make sure that during Christmas time your home will be filled with high spirits, love, kindness and mutual understanding.